As many as six English players taking part in the ongoing IPL XII will return to England by the set deadline of April 26 missing the business end of the tournament. While five of them – Jos Buttler, Jonny Bairstow, Ben Stokes, Moeen Ali and Joe Denly have been named in England’s 15-member World Cup squad, Jofra Archer has made it to the England limited-overs’ squad for the Pakistan ODI series. Rajasthan Royals, already second-last in the points table, will be the most affected with three players – Buttler, Stokes and Archer – leaving for national duty. Both, their leading run-getter and wicket-taker (thus far) will board the plane back to England. 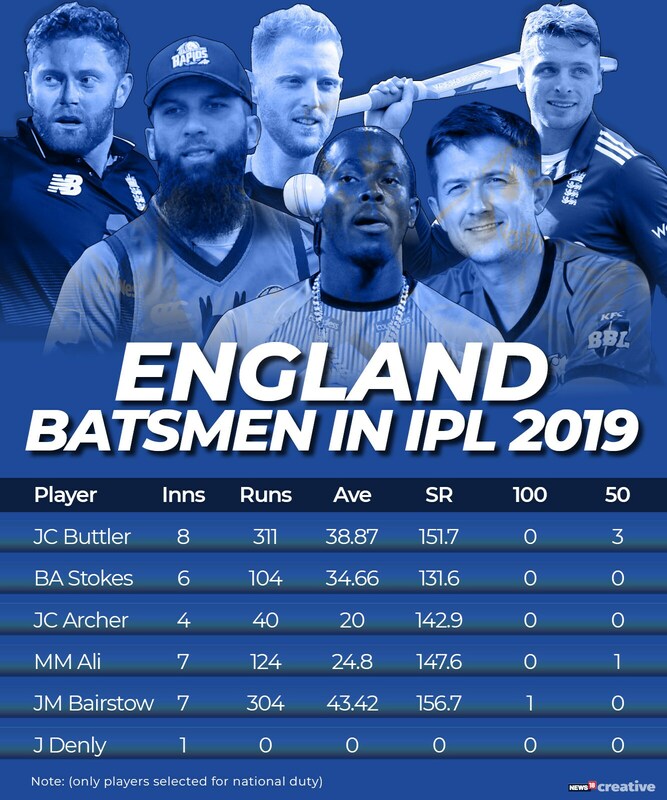 Buttler is the leading run-getter for RR and the fifth-highest overall in IPL XII thus far with 311 runs in 8 innings at an average of 38.87 and strike rate of 151.7. Jofry Archer is the leading wicket-taker for RR with 10 wickets in 8 innings at 21 apiece. He has also been very economical conceding just 6.77 runs per over. He has been excellent at the death (overs 16-20) with 60% of his wickets for RR coming in this phase of play. 32.05% of his deliveries are dot balls which means that almost every third delivery he bowls at the death is a dot ball. His economy rate of 8.85 is also quite good for this phase of the innings. 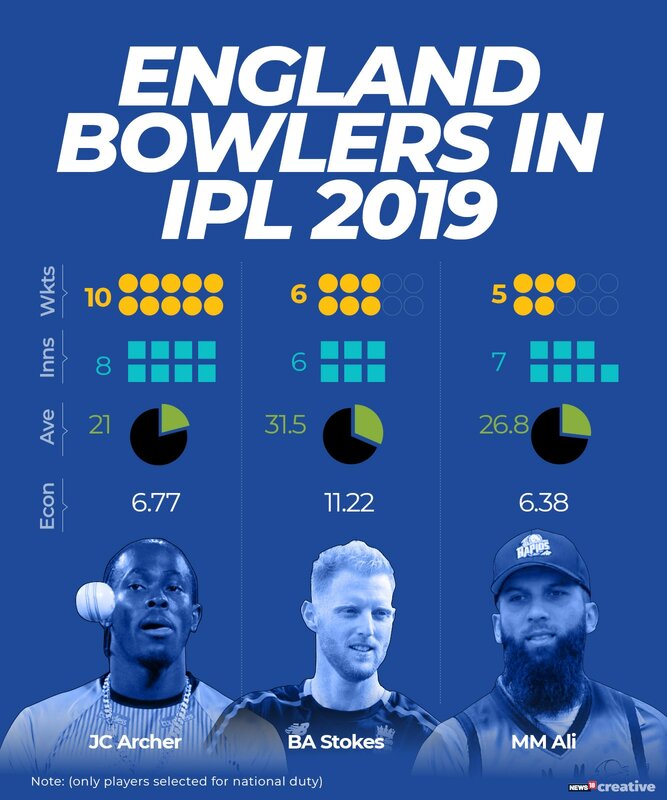 While Ben Stokes hasn’t had the best IPL season with no game-changing performance with the bat or ball, he did glimpses of his potential with his 26-ball 46 against CSK. Sunrisers will miss the services of Jonny Bairstow – their second-highest scorer – with 304 runs in 7 innings at an average of 43.42 and strike rate of 156.70 in his debut IPL year. Moeen Ali has had a decent showing for RCB this season. His 124 runs batting in the lower middle-order have come at a rate of 147.61 while he has also been very economical with the ball with an economy of just 6.38. Joe Denly was out for a golden duck in the only match he played for Kolkata Knight Riders against Delhi Capitals. Both, Buttler and Bairstow have outstanding ODI records for England. While the former has scored 3387 runs in 105 innings at an average of 40.80 and astonishing strike rate of 118.34 – the second-highest in ODI history (min. 2000 runs), Bairstow is one of the most feared openers in contemporary ODI cricket. He has scored 2118 runs in just 54 innings at an average of 46.04 and strike rate of 105, including 6 hundreds. Buttler has an exceptional T20 record too and aggregates 5708 runs in 228 T20 innings at an average of 30.52 and strike rate of 144.43. Bairstow has scored 2070 runs in 94 innings at an average of 26.88 and strike rate of 131.26 in his T20 career. Stokes has the experience of playing over 100 T20 matches and has scored in excess of 2000 runs in the format while also chipping in with crucial breakthroughs with the ball. Ali aggregates 2707 runs at a strike rate of 135.41 in 125 T20 matches and has also picked 89 wickets at an economy rate of 7.6. Archer has been brilliant with the ball in the format with his ability to pick wickets having picked 115 wickets in just 86 innings at 22.26 apiece at a strike rate of 16.9. Denly is a veteran of 203 T20s having scored in excess of 5000 runs in the format.